The Grape Solar 400-Watt Off-Grid Solar Panel Kit is ideal for a variety of applications, including emergency backup systems, RVs, boats, 12 Volt battery charging, small pumps, charging small electronic devices and operating LED lights. Made with high efficiency crystalline solar cells for years of service, this solar kit is easy to install and virtually maintenance free! An anodized aluminum frame and a sealed junction box make the panel weatherproof for outdoor use. A two diode bypass minimizes power drop caused by shade. This system will provide approximately 1,200 Watt Hours or 100 Amp Hours of charge per day. 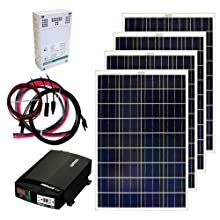 The kit includes: 4 pc 100-Watt polycrystalline solar panels, a 35 Amp charge controller, 2,000-watt inverter with two outlets and 1 USB port, cables and manual. 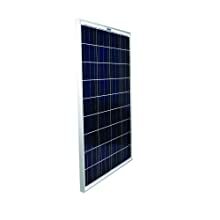 Each kit comes with 4 high efficiency Grape Solar GS-STAR-100W crystalline solar panels. The GS-STAR-100W features: A 2-diode junction box for enhanced performance, MC4 connectors on the positive and negative leads for a secure, weather-tight connection. High transmittance, low iron tempered glass provides durability and enhanced impact resistance. The Xantrex C35 charge controller is the heart of our 100-series kits due to its versatility and reliability. It is a PWM (Pulse Width Modulated) charge controller that will work with both 12V and 24V battery banks. This charge controller also lets you add an additional Grape Solar 100W panel to the 400 Watt kit. The Grape Solar Pure Power 1,800-Watt inverter features True Sine-Wave AC output of 1,800 watts. 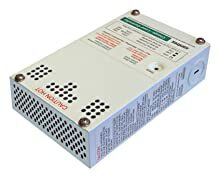 With high surge capability, the Grape Solar 1,800 Pure Power Inverter provides the necessary current to startup demanding electrical loads such as variable speed power tools, advanced electrical appliances, microwaves and much more. In addition to dual GFCI AC receptacles, the Grape Solar Pure Power 1,800 includes an innovative USB connection for providing power to most USB chargeable devices. 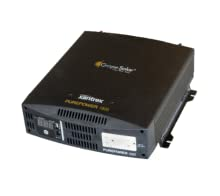 the Grape Solar Pure Power 1,800 offers many safety features not found in similar inverters.